Prospective corps members from tertiary institutions across Benue State have protested to the state headquarters of the National Youth Service Corps (NYSC) over their alleged ban from serving their father land in the next batch. It was gathered that on October 2 this year, when the NYSC portal opened, graduates from Benue State University (BSU), Federal University of Agriculture, Makurdi (FUAM) and Fidei Polytechnic could not access the portal to register. It was later gathered that the NYSC had prevented prospective corps members from the above named tertiary institutions from registering because some of the graduates were found culpable of age falsification. Although the rumour mill had it that the affected schools were slammed a two-year ban from presenting graduates for mobilisation for NYSC. 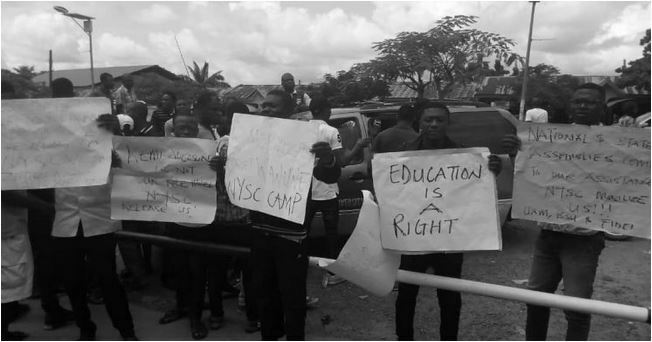 The aggrieved protesters, who went about their protest in a peaceful manner with placards bearing different inscriptions, however, expressed displeasure at the decision of NYSC to make every graduate in the affected institutions scapegoats for what they said many of them knew nothing about. They enjoined the Director General of NYSC to look into their plight and ensure a resolution of the matter within the shortest possible period, to enable them register and meet up with mobilisation for the next batch of corps members. State Coordinator of NYSC, Mrs. Eno Awakessien, who addressed the protesters, agreed that the graduates had genuine grievances, but blamed the anomaly on the students’ affairs officers of the affected schools for colluding with over-aged students in the matter. Awakessien, who disclosed that six institutions were affected by the ban, however, promised to channel their demand to the appropriate quarters. “We discovered students officers fielded names of over aged students or names of students that read courses that are excluded from NYSC mobilisation. The students affairs had colluded with some students who were quite ambitious and wanted to serve at all cost and registered them for service. “An audit was carried out on most of the institutions nationwide and eventually six major institutions were affected and many of them are actually from Benue State. The audit report has been sent to the affected schools and the schools are aware of what exactly is expected of them,” said, Awakessien. Meanwhile, Vice Chancellor of BSU, Prof. Msugh Kembe in a chat with newsmen in his office yesterday disclosed that as soon as the issue was brought to his knowledge that the institution’s list of graduates could not be uploaded on the NYSC portal, he directed that a letter be written to the DG of NYSC. Kembe said the school had just received a reply to that letter from the NYSC and was studying it to ascertain the cause and apply commensurate sanctions where necessary. “The whole issue had to do with alterations in date of birth of some prospective corps members and we want to find out where that is coming from. We will constitute a committee to investigate the matter. The VC also appealed to the NYSC to temper justice with mercy in the matter and punish only those who were found guilty rather than punishing a whole institution for the sin committed by few people.